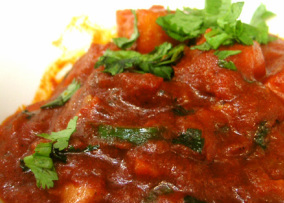 Traditional poultry dish prepared in a spicy curry sauce of ground onions, garlic, ginger, tomatoes, and seasonings. Curried chicken cooked with fresh spinach and lightly spiced. Chicken cooked in a fiery, red hot curry sauce. A specialty from Goa. Strips of chicken marinated with fresh ground spices and sauteed with tomatoes, onions, and bell peppers. 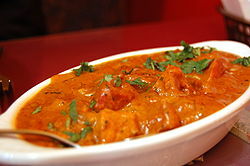 Boneless cubes of chicken cooked in traditional spices. A south Indian specialty. Barbecued cubes of chicken cooked with tomatoes, onions, and yogurt. An all time favorite. 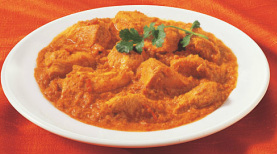 Boneless tandoori chicken cooked in a rich creamy sauce with fresh tomatoes and combination of delicate spices.